This is a story based on personal experience. It is not peer reviewed and has no footnotes for you. It is not academic (though I have plenty of stories of clients and students that have healed through food…). This is just a story of how a tremendously healing meal…one that is SO easy to make…so deeply nourishing…worked its magic in my own home. On symptoms we had NO IDEA it would clear. The Gut and Psychology Syndrome™, aka, “GAPS” diet, is known mostly for its ability to heal symptoms of brain function that are connected to the relative health or damage of the gut. ADD, ADHD, Autism Spectrum, brain fog, dyslexia, dyspraxia, schizophrenia to name a few. I teach how to cook for the GAPS diet, and most of the people who attend or wish to work with me have those symptoms. I am used to the idea of eating to heal the gut, and subsequently, brain function. Dr. Natasha Campbell-McBride, author of the GAPS diet, has been saying for years (and I believe her) that all physical symptoms can be traced to the gut, a leaky gut, that is. She is currently writing the “Gut and Physiology Syndrome”…which says just that. But now, I got to see and experience first-hand, how the GAPS diet heals so many other things. Yep. All of the above symptoms back into normal range…or no longer symptoms, within just two months. These were chronic, entrenched symptoms, present for decades. And I didn’t even TRY to heal them. No special diet, no “intake” done. It was merely the result of eating the way we eat in my home…organic whenever possible, no processed foods, no soda or soft drinks. And one other thing. We eat Meat Stock two or three times a week in my home. Yep. That’s it. Meat Stock. What IS “Meat Stock”? Meat Stock is what I call the “One Pot Meal that Heals™”… because that’s what it does. It heals. Meat Stock is the foundation of the GAPS diet, it is the food that provides the nutrients that heal a leaky gut…and then the symptoms of that leaky gut. Meat Stock is NOT just broth. It is NOT bone broth. It is faster to make, and more nutrient-dense than bone broth. Meat Stock is an entire MEAL…you eat the meat, you drink the stock that is made from the meat, and you eat the vegetables, (with liberal amounts of healthy traditional fats, like pastured butter, tallow, duck fat…and good, high mineral sea salt.) Meat Stock is made with any meat with a joint and connective tissue–chicken, turkey, duck, quail, beef, bison, lamb, pork, fish…It’s a one pot meal. Did I mention that it heals? So what can Meat Stock heal? If it could be as easy as changing your diet and eating a One Pot Meal that Heals™…aka, Meat Stock, wouldn’t you be interested? Even if it didn’t clear everything within two months, wouldn’t it be worth it? Imagine if you worked with someone to implement the GAPS diet over a period of six months – two years, how much could be healed?! If you would like some guidance as you cook to heal your leaky gut and the symptoms that come from it, contact me. Nope. It does not–at least, according to the GAPS (Gut and Psychology Syndrome) Diet. In fact, bone broth is not even mentioned in the diet! Can you believe it? A little background here. I came across the book Gut and Psychology Syndrome in 2007, in my search for healing diets specifically for children with autism spectrum and ADD or ADHD. I had read many others, parts of which included many things that I could see would work. But somehow, they never felt complete to me. That same year, nearly a decade ago, I was blessed to meet Dr. Natasha Campbell-McBride, author of the book and creator of the healing protocol for which the book is named at the 2007 annual conference of the Weston A. Price Foundation in Chantilly, Virginia. I remember that I drove out from my home in Silver Spring, Maryland specifically to hear Dr. Natasha’s talk on the Gut and Psychology Syndrome. That day, she talked for a mere hour and fifteen minutes, one of many other “track” speakers. (At nearly every conference since then, Dr. Natasha has presented an entire day on GAPS. This was the introduction of her work to “WAPers” and others who sought alternative healing based on traditional foods.) As I sat and listened to her talk, tears welled up and I cried. I cried the tears of knowing that I had finally found someone with answers to why people were so sick. Why the children were so sick, and what could be done about it. The program she explained felt complete. It had the missing pieces. And it started with THE FOOD. For those of you who know me, you know that I believe and have built my life’s work on the understanding that “food is the foundation”. Good food. Real food. Food that is raised in a sustainable way. Food that nourishes the land as it is grown, and the people that eat it. Food that is cooked in a way that preserves and maximizes nutrient value and digestibility. Food provides the building blocks, macro and micro-nutrients that the human body needs to thrive. It has come to be known as “nourishing, traditional food”, based on the principles of Dr. Weston A. Price, and the cookbook that Sally Fallon (Morell) published in 1998, Nourishing Traditions. To hear that day a medical doctor talk about how AUTISM could be healed through FOOD…how it worked and why it worked, was at the same time mind-blowing to me, and obviously simple. Of course it could. Of course it would. So, after that day, I set myself the task of learning the diet, inside and out, the nuances, the cooking techniques so that I could share them with anyone who would listen…and I do that to this day. I developed cooking classes specific to the GAPS diet in 2010. When I was introduced to Dr. Joseph Mercola in 2011 by Dr. Natasha and her husband at the Wise Traditions Conference in Dallas, and they told him I had developed cooking classes for the GAPS diet, he used the term “ground breaking”. Yes, they were–and yes, they are, for I am still working to teach those techniques that are specific to GAPS, to clear up misunderstandings about cooking for the diet and how it works. I write, I blog, I speak, I teach. Wherever and whenever I can. When I realized the misunderstanding about bone broth that was going around the forums and list serves at that time–that moms all over the country were trying to implement the diet with bone broth–long cooked bone broth, full of glutamic acid (read “MSG”), which could trigger neurological symptoms in those that had them (read “autistic children”) had to be corrected. There is no bone broth in GAPS, folks. The stock that Dr. Natasha writes about is clearly Meat Stock. Short cooked stock, made from meaty bones with joints and connective tissue. Yes, you can throw in marrow bones for their added goodness, but they are not the main ingredients. I invite you to take a read of my book on Meat Stock and Bone Broth. I also invite you to experience the most healing part of the GAPS diet, the “Intro” with me during what I am calling “Jump Start: GAPS”, an online program I am offering February 20 – 27. An easy, inexpensive way to access me, a Certified GAPS Practitioner and a Teaching Chef, and have your questions answered. More info about Jump Start: GAPS here. Note: Some of the above are affiliate links. Thank you for supporting my writing. Read my article on Selene River Press: Candida, Thrush, or Eczema got you Down? Try Kefir! Looks like sour cream, tastes like sour cream…? New! GAPS Intro Diet Chart! So you have been wanting to try the Gut and Psychology SyndromeTM (aka, GAPS) diet, but you don’t know where to start. Or…you have tried it before, but got confused, and dropped out. Or…you know you have symptoms of a leaky gut, but don’t know what to do about it. Want some assistance in sorting it all out? Yes! Want this all to be easy peasey? Yes! How about a handy, dandy, well-organized and beautiful chart that lets you know what to do, how to do it, and when? I am happy to announce my third chart, this one for the Intro Diet of the Gut and Psychology Syndrome, the healing protocol developed by Dr. Natasha Campbell-McBride. This way of eating heals the symptoms caused by a leaky gut. Symptoms include: Autism Spectrum Disorder, ADD, ADHD, dyslexia, dyspraxia, depression, schizophrenia…and many more! I am also a teacher to the core of my being. I love to share information. I love to educate. Most of all, I love to give people tools to help them to heal themselves. I developed this particular chart because I believe in the healing capabilities of the Gut and Psychology SyndromeTM protocol. Why now? Because I keep meeting people, hearing stories, and working with clients to implement the GAPS diet that are very confused. Confused about what to do when, (what to cook and when to eat it…and how to move from stage to stage). So, I took matters into my own hands, and created this chart. As I mentioned earlier, it is easy to follow, contains all the information you need, and is pleasing to the eye. My hope is that it will assist many people on their journey back to the innate health and well-being that is their birthright. The chart is available now, on my website, as a download. 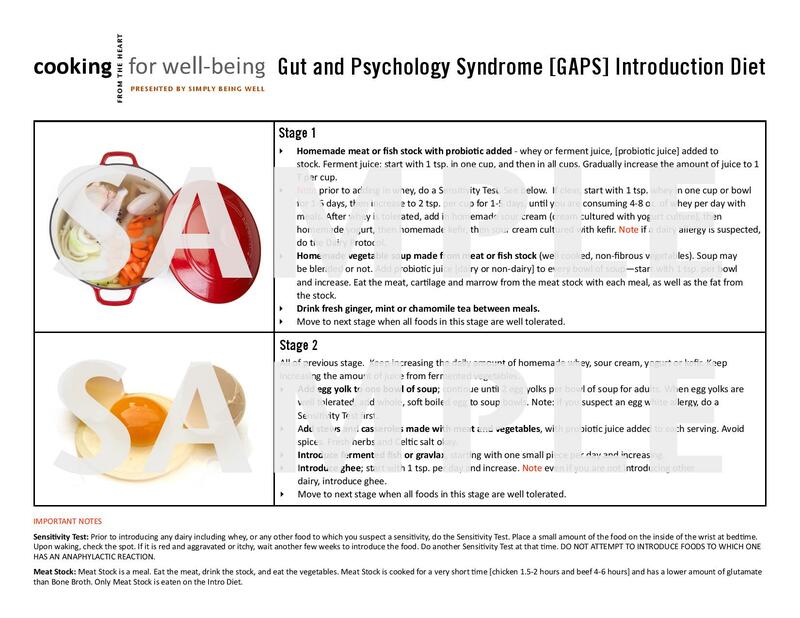 I will be giving away 5 of my new GAPS Intro Diet Charts on September 1, by random drawing. These will be printed charts that will be mailed to winners. One chart per household. The deadline is August 31, at 10pm MT. Everyone who enters will be notified of the results via email. To enter to win your GAPS Intro Diet Chart, please answer the following questions in the comments, with a minimum of 5 sentences. What has your experience with the GAPS diet been? What questions do you have regarding the diet? What are you hoping to gain from the Intro Chart? If you are new to the diet, what are you hoping to heal by going on it? If the Chart is not enough, you may wish to set up a Wellness Consultation to go learn how to easily cook for the Gut and Psychology Syndrome diet! Sometimes it takes just one consultation to get on the right track! Here’s to ease of healing! What is a Leaky Gut, anyway?! There’s a lot of talk these days about a “leaky gut”. What is it? Why should you care? The part of the “gut” that the term refers to is the duodenum of the small intestine. The duodenum is the first part of the small intestine into which the stomach dumps its high acid mixture for further digestion and absorption. If that part of the small intestine has holes in it or is damaged, it is termed “leaky”. That’s because it leaks. Into the bloodstream…your bloodstream. The transportation system of the body, the one that carries nutrients to cells, and wastes away from cells…read on. Your food has not been digested, so your body will not get the nutrients from the food. If this goes on for a long time, you will be malnourished, and suffer the symptoms that that brings. Your food has not been digested, so large molecules will leak into the bloodstream. If they are protein molecules, the body will recognize them as “foreign proteins”, and launch an immune response. If this goes on for a long time, you will likely develop autoimmune disorders. Foreign food molecules in the bloodstream mean that you will develop food sensitivities. In the beginning, just a few sensitivities. As time goes on, your body will become highly reactive to many foods. Toxins will also leak into the bloodstream, which will go to the brain and cause focusing issues, brain fog, and inability to concentrate. If this goes on for a while, ADD, ADHD, OCD, SPD, depression, and mood swings–think bipolar– can develop. Schizophrenia has also been indicated. Okay, so if all of that is probable with a leaky gut, why not heal it? It’s easy once you know how. For more information about the best protocol I know to heal AND seal the gut, check out http://www.gaps.me/. Why Train to Cook for the GAPS Diet?!! As you may or may not know, cooking for the Gut and Psychology Syndrome diet is not the same as traditional food cooking, a la WAPF or the Nourishing Traditions cookbook by Sally Fallon. In fact, may people who implement the diet from Nourishing Traditions miss many important differences between GAPS and NT. They also make mistakes in the implementation, which may delay healing and actually aggravate symptoms. Some of the symptoms can be severe, like seizures, if you are prone to them! Lesser symptoms include migraines, headaches, nervous tics, rage and outbursts, stimming, brain fog…eczema…! The GAPS diet is a therapeutic diet…with very specific techniques that were developed to achieve therapeutic results. For years I have been on list serves for the GAPS diet, and I have read horror stories about well-meaning moms who were trying their best to implement the diet for their severely autistic children and others. The children were refusing to drink the bone broth and their mothers were trying to sneak it in wherever they could. And the children were having severe symptoms, mothers often reporting that symptoms were getting worse, not better. Much of this could have been avoided if there had been a clear understanding of how to cook for the diet. So…….if you would like to Heal Your Leaky Gut…you must do the Intro of the Diet. All six stages. No bone broth! I will be teaching the techniques you will need to implement the Intro THIS MAY, Saturday and Sunday, the 16 and 17, in Fort Collins, CO. I have priced the weekend very reasonably so that many can join me! I hope you will attend! “I recently attended Monica Corrado’s GAPS cooking series and was blown away by how much I learned (and how much I have been doing and teaching incorrectly), even after being involved in GAPS for almost a year! Although I have been constantly learning since being introduced to the GAPS diet, my certification training did not prepare me nearly enough to guide my clients in the intricacies of food portion of this healing protocol. And as food is the primary healing means of this protocol, it is vital that we understand it well. I now feel better equipped to assist my clients and myself through this healing journey. I also enjoyed Monica’s high-energy, down-to-earth teaching and techniques. Because of her passion and her clear, memorable explanations, I will be able to remember and pass on what I learned. This is worth just as much as the content, in my opinion. Any resources invested in learning cooking with Monica is well worth it–whether going through the diet yourself or assisting others through it. I would recommend this course to anyone!” Amy Mihaly, FNP, Certified GAPS Practitioner, Loveland, CO of Wholly Guts. Dr. Natasha Campbell-McBride, author of the Gut and Psychology Syndrome, is very familiar with and supportive of my work of training people to cook for the GAPS diet. This training is not currently offered in this way elsewhere. Since Food is the Foundation of the diet, knowing how to cook the food for the diet is absolutely necessary.